On August 20, Columbus Academy opened its 108th school year with 1,120 students from 54 different zip codes in and around Central Ohio. For the first time in school history, Academy offered a classroom for 3-year-olds called the Explorers program. 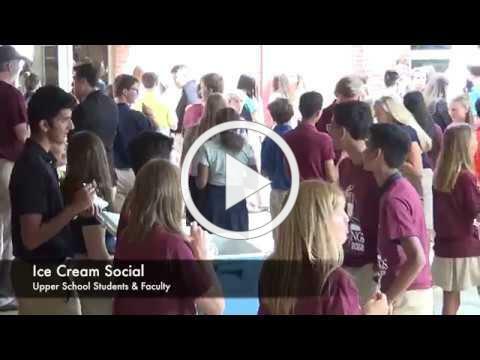 "We spend so much time and effort planning events and creating spaces, so we can't wait to see the results," said Head of School Melissa Soderberg in a back-to-school news article. "I especially look forward to hearing all about the internships and amazing experiences our older students had this summer." The Parents' Association of Columbus Academy has renamed its monthly meeting to the PACA Forum in order to more accurately represent what it is: an opportunity for you to a) hear about current topics of interest at the school, b) meet other parents, c) get any questions answered and d) find out more ways to be involved in PACA and the school. These forums -- the first of which is scheduled for 8:00-9:15 a.m. this upcoming Wednesday, September 5 -- are most certainly open to all parents and guardians, and a light breakfast is provided in the Dining Hall. The Viking Corner will be open as well, should you wish to pick up some spiritwear for your child(ren). The start of the school year has been focused on implementing the new communications approach, and PACA hopes to add video posts of future forums as well as selected forums/events/meetings later in the year for those who cannot attend. Registration is now open for the 2018 Viking Rampage Challenge! Join us on the morning of Saturday, September 15, for the third annual Viking Rampage Challenge, where you and your family get the opportunity to explore our 231-acre campus as you race through obstacles throughout the woods (possibly in wet and muddy conditions). Then stick around for more CA Community Day activities including numerous home athletic events, food trucks, Matt the Balloon Guy, a caricaturist, assorted games and prizes, and much more! On the night before CA Community Day (see above), our Lower School will be hosting a Family Campout. Following tent setup and a pizza dinner, families will attend the varsity football team's 7:00 p.m. game against archrival Bexley. Postgame activities include a campfire, stories and s'mores at the Crane Outdoor Learning Center. In the morning, a doughnut breakfast will lead into the 3rd annual Viking Rampage Challenge and many other CA Community Day events! On Wednesday, our students in Middle and Upper School participated in "The Big Table," a day of community discussion across the city presented by The Columbus Foundation. During lunch, the middle-schoolers met with their advisory groups while upper-schoolers gathered in small groups to discuss ways in which Academy and the Central Ohio region can be strengthened by working together to understand one another and the needs of the surrounding community. The discussion was led by students who brainstormed the community's strengths and its needs, followed by ways to help make improvements and spread kindness. How we see the world, decide which values to uphold, understand the unfamiliar, raise our kids -- all these depend on our personal histories, inform who we are and guide whom we want to be. Parent SEED brings together CA parents and those caring for CA students who are interested in looking at issues in diversity, inclusion and multiculturalism (such as racism, class, poverty, gender identity, disability rights, etc.) through their own eyes and those of fellow parents. Through a series of seven meetings -- enhanced by selected readings, videos and speakers -- we discuss topics important and sometimes uncomfortable in a confidential and safe space at school. These meetings will be held from 8:00-9:30 a.m. on September 6, October 8, November 1, January 22, February 12, April 8 and May 6. For further information, please contact Parent SEED leader Joyce Simson P'08 at 614-554-9238 or jrs@ix.netcom.com. Instrumental music instructors Jessica Sneeringer and Susan O'Rourke were thrilled to welcome back their musicians for Band Day on August 16. To see a profile of our pep band, click here. And to watch a performance of "Crazy Train" followed by Academy's fight song from last year's Charlie David Dinner, click here. Thank you to all of the Columbus Academy students, faculty, staff and family volunteers for their efforts during this month's Walls Build. Their hard work will provide a deserving family the opportunity to purchase affordable housing through Habitat for Humanity! After an exciting summer during which they both competed in the 2018 AAU Junior Olympic Games among other elite events, Columbus Academy junior Kiersten Thomassey and sophomore Regan Cornelius have both been named among the top 50 players in the country for their class years by MAX Field Hockey!